Our sweet S arrived on Friday at 6:10 pm. He's little (was 36 wks and 3 days) but perfect in every way. Looks just like his brothers did...they've all been carbon-copies at birth. We came home on Sunday and have been enjoying getting to know him. The boys are very taken with him of course. C2 wasn't so sure about him on Saturday, but has decided he's OK....loves to give him kisses. We are so blessed. I can't believe that October is almost halfway over. This year has flown by. We've had a crazy few months. I joke and tell people we're trying to get all of our major life changes over this year... HA! 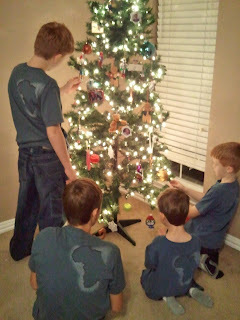 We started off by deciding to homeschool our 3 school age boys. John changed jobs, leaving the church he had been pastoring for over 8 yrs to help lead a new missions organization doing work in India. It's been a wild ride. Sometimes we just look at each other and laugh, but it's really be amazing and fun to see what God has in store for us. We look at it as an adventure. It's been a great thing for our family. John is home more and with homeschooling we get a lot more family time. The boys are liking it too so that makes it so much easier. Our little surprise package is another blessing....we didn't plan or expect to travel down this road again...we're looking forward to meeting him in January! Our adoption is currently on hold until at least next fall. Our agency requires that the baby be 9 months old before resuming things. It's been wonderful though to watch all the kids coming home to their forever families this year...can't wait til it's our turn. We've had a crazy past few months....had a wonderful Christmas w/ family, got to meet my little great-nephew (who needs to move closer BTW!) and spent a lot of time together. We spent a lot of time since January at various basketball games...when you have 3 boys playing in 3 different age groups....we had basically something basketball related every night of the week. The older boys are now finishing up w/ track...YAY! We're all healthy and happy...just ready for summer. In adoption news...we're finally in the "home study" phase. Waiting for our agency to review our 2nd application and get the initial visit scheduled. We've had a very encouraging week past week....several families bringing their children home and several more headed to Ethiopia over the next 3 weeks to meet their children and go to court. To see the new families together....sigh....it's a beautiful thing! This week we remember the death and resurrection of Jesus...the perfect sacrifice...who died so that we could live in freedom from our sin and be called children of God. Hope you all have a very Merry Christmas! We're looking forward to celebrating with family and friends. John has the privilege of baptizing our sweet E tomorrow on Christmas day. God truly continues to bless us. ...and help adopting families at the same time! 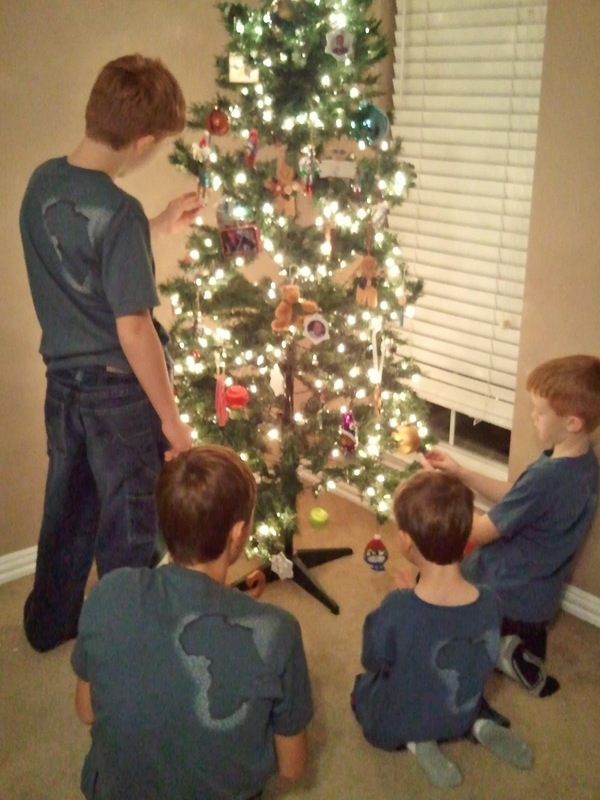 Lora Lynn started Home for Christmas last year when she and her family were working on bringing their sweet Mira home from Uganda. 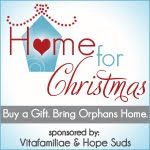 This year Mira's home for her first Christmas with her forever family and Lora Lynn is once again helping other adoptive families raise money to help bring their children home by highlighting some great gift ideas. Click on the Home for Christmas icon on the side bar to see some great shopping opportunities...including my Etsy Shop that's listed under Glass Pendant Necklaces. Just got the shirts in today. They look great! Will be getting them sent out by next week. Thank you so much to everyone who ordered one. I'm hoping to have a new design ready in January for Valentine's day. Also, I'm now an Amazon affiliate...if you click through the link on the sidebar, we'll get a commission from whatever you purchase...doesn't cost you anything and all proceeds go to our adoption fund. Thanks! We're taking orders for our adoption t-shirts to help raise money for our adoption expenses. 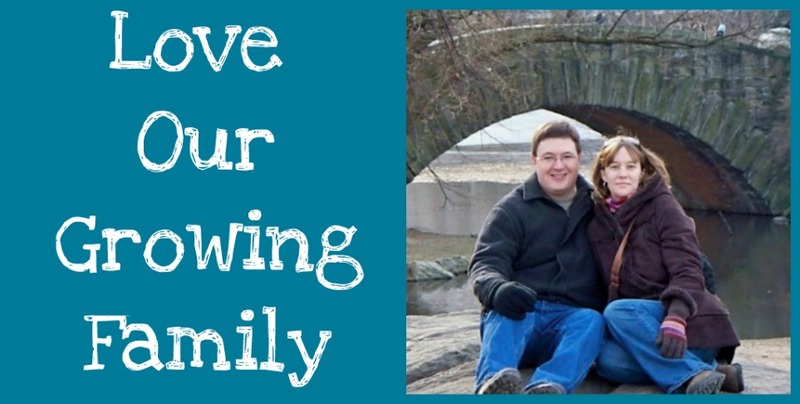 Click on the link http://growingfamilyfundraising.blogspot.com/ or the Simply Love button on the left sidebar to go to our fundraiser page. We've been very blessed to find so many resources online and in the blog world to help us along the way... Kari has an adopted daughter from Ethiopia and has become a great resource for information and advocacy for adoption. Having her help with fundraising has been wonderful. Please email me or leave me note in the comments if you have any questions! Shop here to help us raise funds for our adoption. Buy coffee and help support our adoption. We receive $5 per bag sold. Thank you for donating to our adoption fund! Every little amount helps. We are so grateful!